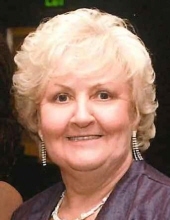 Rose Gherman of Troy passed away peacefully April 2, 2019. She was 65 years old. Rose was born May 6, 1953 in Taut, Romania to Elizabeth (nee Kovacs) and Alex Kiraly. A proud and beautiful soul, Rose always made sure to take care of her family. Her grandchildren were the light of her life. She was deeply loved and will be missed beyond measure. She is survived by her beloved husband of 46 years, George, and her children, Rose (John) Chesney, Georgette (Rich) Luster, and John Gherman, and her grandchildren, Joshua and Elise Chesney and Taylor and Morgan Luster. She is also survived by her siblings, Martin (Elizabeth) Kiraly, Julie (Mike) Molnar, Elizabeth (the late John) Varga, and Frank (Margaret) Kiraly, and many extended loved ones and friends. Rose was preceded in death by her brother, Alex Kiraly. Friends may visit at Lynch & Sons Funeral Home, 1368 N. Crooks Road (between 14-15 Mile Rds.) Monday, April 8th, 3-8pm. A Funeral Service will be held at American Hungarian Reformed Church, 9901 Allen Road in Allen Park, Tuesday, April 9th at 10am. Burial will follow in White Chapel Cemetery in Troy. "Email Address" would like to share the life celebration of Rose Gherman. Click on the "link" to go to share a favorite memory or leave a condolence message for the family.